Arts of the Medieval Cathedrals now available! 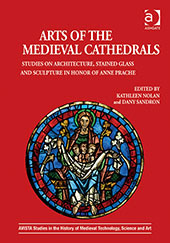 The ninth volume in the AVISTA series for Ashgate Press, Arts of the Medieval Cathedrals: Studies on Architecture, Stained Glass and Sculpture in Honor of Anne Prache, eds. Kathleen Nolan and Dany Sandron, is now available. Beautifully illustrated with 31 color and 126 black and white images, this volume emerged from several AVISTA sessions at the 2010 International Medieval Congress in Kalamazoo, and is intended to “provide a window onto key directions in the study of medieval monuments in the early twenty-first century and paint a picture of the vibrant scholarship that is Prache’s legacy.” AVISTA members receive a 20% discount for titles in our series.